Anybody that knows me or has heard me speak at one point in time has heard me say how I would like to be photoshopped into a tall hot blond. Well, I no longer need to have that done. Olivia Newton-John is now my speaking double! So, now that we all have that song playing in our heads, what we are going to talk about are the physical properties of soil. Not about Olivia Newton-John in a leotard. You have to love the 80’s. In week 5 of the Ag 101 Series, we started talking about the difference between amendments and fertilizers. I went over the basic definitions and said that amendments change the physical and chemical properties of the soil. “Amendments are used to change the physical & chemical properties of a soil. It is a long-term project that should be carried out over the course of several months if not years. My husband hates when I say years, but it is true. He thinks I’m going to scare people. But think about it - Soil was not created overnight nor will you be able to change it overnight”. In general, you use amendments to improve the soil condition to improve crop health and create conditions where nutrients are more efficiently and effectively available to the plant. What are some physical properties of soil? Although not necessarily the first consideration when it comes to soil fertility decisions, it is an indication of water saturation issues that can affect land use and management decisions. Soil color is one of the most useful characteristics used in identifying and classifying soils. Two main factors that influence it are organic matter and iron content. It is not something we necessarily need to change; it is, however, something to take note of because of the factors it affects. It does not take a high level of organic matter to change the color of the soil. Generally speaking, the darker the soil, the more organic matter it has. Iron and other mineral content also dictate soil color. 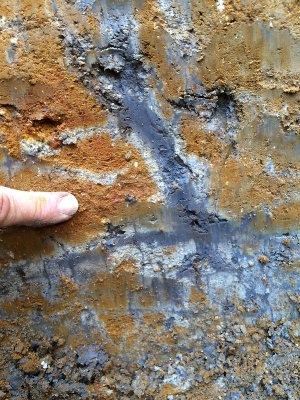 Features in a soils horizon – a layer of soil parallel to the soil surface– will show evidence of chemical reactions represented as redoximorphic features, a term that simply means the formation of reduction and oxidation features. One is called gleyed soil, which is caused by prolonged water saturation showing up in the soil profile as fairly uniform greenish or bluish colors throughout the soil horizon. Gleyed soils are usually poorly drained and waterlogged. Another feature, splotchier in appearance is called mottling. The mottled soil is usually wet periodically but not for prolonged periods of time. It shows up in a soil profile -a vertical section of soil- as spots, blotches, or streaking of a different color interspersed within the dominant color. One of my favorite college professors would say it was like golden drops of honey. I’m not sure why because it never looked like honey to me, but I have never forgotten it either. It is the combination of and the arrangement of soil particles into secondary particles known as units or peds. These are characterized and classified by size, shape, and grade based on the strength of soil aggregates, which we’ll talk about next. Soil structure is an indication of pore space ultimately affecting infiltration and how permeable soil is. Management practices such as over tillage, use, vegetation removal, and nutrient imbalances can lead to compromised soil structure. Aggregate stability is a term agronomist use to refer to the soils ability to resist degradation like erosion by outside forces such as rain. Predicated on a soils texture and structural characteristics, it is a dynamic soil property dependent on clay content and biological processes as well. Smaller aggregates tend to be more stable than larger. However, balance is needed for overall stability. It is simply the ease with which gases, liquids, and roots can pass through the soil, and is largely dependent on the texture and structure. It is a function of the moisture content, surface conditions such as roughness, slope and plant cover. Vegetative cover, tillage practices, and cover cropping all have an impact on it. The downward flow of water from the surface through the soil is known as infiltration. Infiltration rates of soil are measured in its ability to absorb an amount of rain or irrigation water during a given period and usually expressed in inches per hour. Coarse textured soils, such as sands and gravel, have higher infiltration rates. The infiltration rate of medium- and fine-textured soils, such as loams, silts, and clays, is lower than coarse textured soils and is influenced by aggregate stability. Water and plant nutrient losses may be higher in soils with more sand and gravel-sized particles. It requires appropriate timing and consideration of sources when choosing amendments, fertilizers, and irrigation practices. Last but not least soil temperature is the measurement of the warmth in the soil. Soil temperature can be affected by sunlight, condensation, evaporation, rainfall, vegetation, tillage practices, slope, and organic matter. Maintaining soil moisture, proper soil management practices, use of cover crops, and sufficient organic matter are ways to regulate the temperature. Ideal soil temperatures for planting most crops are 65 to 75 F. (18 to 24 C.). Since insects and diseases thrive in certain soil temperatures, it can also be useful information for tracking and predicting them. The efficiency and availability of amendments and fertilizers are dependent on soil temperate as well. Making sure soil is warm enough for biological activity sufficient for proper utilization will help with getting the most out of your fertilizer/amendment dollar. Nutrient management decisions are dependent on monitoring ideal levels to ensure a successful crop growth and maximize the effectiveness of amendments like lime and sulfur. Not that I would rely on this now on an intense production scale, but in my backyard garden I still rely on the old-timer’s method of feeling the soil with the back of your hand. They would say if it feels warm to you it’s warm enough to work. Now with the advent of technology, there are several resources available to farmers. A good one that I use on a regular basis is AgWeb. It tracks national and local conditions about drought, precipitation, temperature, growing conditions, and more. Next week we'll talk about a subject that landed me a "Thank You..."